According to statistics from the Beijing Municipal Commission of City Administration, the city produced 6.72 million tons of domestic garbage in 2008 and the amount is growing by 8 per cent a year. 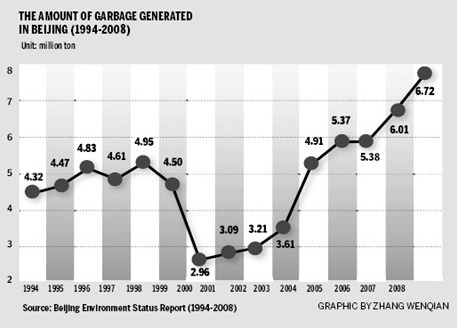 Although, to look on the bright side, last year witnessed a 0.5 per cent fall in garbage generation compared with 2008. But, whichever way you look at it garbage is a growing problem, and one that is threatening to get out of control.